I know it has been a long while since I have posted – I apologize for that – life has just been busy. The little one (I need to find another way to include her in our conversations) is going to make me a grandmother by the end of Oct this year. I keep telling her that “she” will be a Halloween baby. The oldest (and only other child of mine) got engaged the end of June; the wedding will be Aug 2016. A couple of days ago I went back to the area I grew up in and visited my little “Sis”. As we drove around after lunch (killing time before a movie) we went through an area that I hadn’t been in in many decades. I wondered if it was the same intersection near where I had a curious encounter when I was barely in my 20’s. Well after a couple of drinks and many dances, it was time to head for home. I jumped in my trusty, but rusty ’63 “heavy Chevy” Bel Air and drove for home. Not long after, I was right outside the gates for one of the many GM plants in the area, the Bel Air came to a stop. I didn’t have long to wait as the afternoon shift was ending and vehicles were exiting the gates. One problem – no one was stopping. I waved at a few vehicles and their drivers would wave back, but did not stop. Finally there were very few vehicles left and I was beginning to think that I would be walking a few miles to where Momma lived and waking someone up to drive me home; when a young man (older than me though) stopped his vehicle and got out. He asked what was wrong with my vehicle and I said it wouldn’t start. He then asked if I would open the hood so he could look and perhaps find out what was wrong. Being smart enough to not say that I had done that already I let him look under the hood. He couldn’t find anything wrong either, so he shut the hood and asked if I needed a ride to the nearest pay phone. The nearest pay phone put me right where the hookers usually trolled at that hour and I didn’t particularly want to wait for my Pops to come pick me up in that area. I quickly asked him where he had been going before he stopped. He said he was going home. I asked where was home; I mean perhaps with any luck he would be going near to my house on the other side of town. I was in luck!! He was going home to the other end of my neighborhood. I promptly asked if he would drop me off at my house. He looked me over, decided I wasn’t a threat and said he would. Mr. Nice-guy waited till I was settled in his car – no seat belts for us as this was before that was mandatory – and away towards home we went. On the way he asked how old I was, I asked him the same (25); where was I going to school and just general questions. We talked about current movies, books and the like; then he started asking more personal questions. Did I have a steady boyfriend, what did I like to do on weekends, where had I been that night and so on. Being younger and a bit naive, I answered everything and even managed to ask a few questions back; which he didn’t always answer. In a little while we were pulling up in my driveway. I climbed out of his car and then leaned in his open window to thank him and let him know how much I appreciated his help. The next thing I knew he was grabbing my wrists and getting very close to my face. He proceeded to tell me that young girls like me should never climb in a car with a stranger no matter how nice he seemed as you never could tell what could happen. He said the guy could take you to your home like you asked or he could take you anywhere else and you would be in a world of hurt. Then he let go of me and backed out of my driveway. I let myself into my house and woke up my Pops who was very angry that I had gotten into a stranger’s car in the middle of the night. He took me to where my car was and we towed it home. The next day I walked all over my entire neighborhood trying to to find Mr. Nice-guy’s car, I did that for over a week, every morning and could never find out where he lived even though I checked every driveway on the street he said he lived on. Was I with a truly nasty piece of work that night who wasn’t up for it after work or was I just with a guy who wanted to help out a damsel in distress and then decided to warn me about the dangers I could of been in? I will never know. I know I hadn’t thought about that in a long time and it didn’t come back to me till we went by that GM plant and it set the memories in motion. One of my new friends was telling me about her recent trip to Boston and how they started staying at Bed & Breakfasts while on their trip and how much they enjoyed staying in them. I told her that I had always thought about how nice it would be stay at one till we stayed at the one I have affectionately dubbed, “The One From Hell”. The oldest was going off to college and we had to go up to do orientation. Waited just a bit too long to get into a decent hotel in the area so we opted to stay in a Bed & Breakfast that we had found online. The pictures looked good, the description read well and there was a refund guarantee if you didn’t enjoy your stay. We were hooked. Driving up there we were all excited, and even though they had a “policy” about not accepting late arrivals we had called the owner and made arrangements with her. We got there after dark and after unloading by the back porch,the vehicle had to be pulled around to the parking area by the barn. Since sweet hubby had just gotten out of the hospital I was driving and wasn’t too happy about walking back to the house from the barn in the dark. When I got back to the house, we met the owner and encountered our first problem. We were supposed to have the rooms on the ground floor since sweet hubby couldn’t do the stairs easily and was lugging an oxygen tank. She had switched our rooms out for ones on the second floor. Fortunately there was a bathroom on the second floor which only our family would be using as, according to the owner, we were the only ones up on there. Going up the stairs was hard as the railing kept getting lower and lower and totally disappeared by the time you reached the second floor. Made it very hard for someone who was having a hard time breathing and needed the railing to go up the stairs. I asked the owner if she was planning on getting it replaced to a full railing and she said no as she was trying to keep the house as original as possible. Our girls were sleeping in the first room at the top of the stairs. It had a nice queen sized bed in it, a comfy chair and a medium sized color TV that we were assured worked and was hooked up via a satellite so had plenty of channels. I had noticed that the hallway outside of the bedroom had some dead flies and mentioned it to the owner. She said that there had been quite a few of them up there that afternoon but that she had vacuumed them up. I was having a bit of a problem thinking of what to write about and so I decided I would go back and read some old posts for inspiration; it worked and here is what I was reminded about. I have a thing about sea gulls. Ever since I was a small child I have not liked them, not one bit. I remember that as a child we would go to Florida to visit our old neighbors who stayed down there in the winter. (Same people who had cabin in Mio, MI) Often they would accompany us to the beach and feed the gulls. They would hold up pieces of bread in their hand and the gulls would swoop down and grab it. The husband was doing this once to show me how close they would come; he was in awful pain moments later when the gull hit him in the eye with a load of poop. After that I would just stay in or near the car whenever anyone wanted to feed the gulls. Shortly after that occurred, I happened to catch the old Hitchcock movie “The Birds” and after watching gulls attacking people and other scary scenes about birds I didn’t even want to be in the same air space as gulls. They creep me out and I absolutely do not like to be near them. Fast forward to being married and having children of my own and also living out on Long Island. There are hundreds of gulls occupying the air space there; landing in droves in any parking area where there is fast food. I have seen them try to follow people into grocery stores in search of their next snack. On the particular day that I am thinking of, the gulls were at one end of the parking lot; and our family was at the other end getting food from Checker’s, clearly the kids’ choice. We went into Checker’s, ordered and received our food and headed outside to eat at one of their picnic tables. As soon as we sat down and started unwrapping our food, the gulls started coming towards us. I was not going to sit out there unprotected from the gulls, so I took my food and went and sat in our van. Soon my girls and sweet hubby followed suit and the gulls started milling around the van. I was almost finished with my meal, as were the girls, when suddenly the gulls started attacking the top of the van and each other. The more I heard them on the roof and saw how many were circling around the van and walking up to the van, the more creeped out I became. I kept asking the kids to hurry up and finish so that we could leave the parking lot and all the gulls. I was trying hard to keep the terror out of my voice too as I kept an eye on more than 100 gulls that had surrounded the van. It was then that I noticed sweet hubby was quietly chuckling to himself. He knew how much those damn birds bugged me. So I asked him what he found so funny. That was when he confessed that he had ordered extra fries and had dropped them in the parking lot on his way back to the van, as well as, put some on the roof of our vehicle. I wanted to throw him out of the van. Here I was sitting there getting terrified because of my totally irrational fear of those birds only to find out that they were basically attacking our van because of him. I told the kids to buckle up and grab onto their drinks as we were leaving – RIGHT NOW!!! As I drove out of that parking lot, I was yelling at him about his insensitivity and he was chuckling about my “irrational fear” of gulls; when lo and behold a rather large gull landed on the mirror right outside of his window and just seemed to stare at him with pure malice. This caused me to really hit the gas and head for the road. Talking about the backyard reminds me of a couple of things – one of them is the comedy team “The Smothers Brothers”. I was pretty sure that they were the funniest duo on vinyl at that time. One of my favorite bits that they did was about Tommy having a pet chicken. If you have never heard them, here is that skit. I thought that they were pretty funny stuff back then and my oldest sister and I would sit in her room listening to that record and laugh and laugh. At least it was funny til it wasn’t!! I had been begging for a pet for awhile so to shut me up and avoid the kind of pet that one must keep in the house my father decided that I should have chickens and a rooster. Well, mostly the rooster was just mine; my sisters did not like him at all. Suddenly I was Tommy Smothers and I had a pet chicken!! One rainy morning Pops went out to check for eggs and feed the chickens before leaving for his job. He had on his suit, overcoat and galoshes because it was really muddy out there. The chicken coop was on the far side of the garden and I could watch him from his bedroom window. So my sisters, brother and I trooped into the room to watch him feed the chickens. Somehow Red, my name for the rooster, was out of the chicken yard and Pops had to get him back inside so he wouldn’t be a meal for a stray dog or other critter. Pops threw down feed for the chickens and hoped that would make Red come back inside. No dice. So Pops decides that he can herd this rooster back into the chicken yard by opening his top coat and chasing behind Red and yelling. What a spectacle that was!! We were all cheering on Red, of course, and whooping it up inside the house. Suddenly Red turned around and charged at Pops. He was trying to attack Pops with his spurs!! Pops went from being the pursuer to be being the pursued!! Then it happened….. Pops got too close to one of the ditches and down he went!! He went sliding down the embankment and into that nasty, muddy water!! When he finally crawled out he was covered in mud and water was running off his clothes; not to mention that his galoshes were filled with water. Red was back in the chicken yard eating breakfast like nothing had happened. Pops came back up to the house and had to change his entire outfit so he could go to work. He was not happy!! He was loudly cursing that rooster and saying that Red wasn’t going to be with us much longer. I pleaded for my rooster till Pops left for work. Fast forward to the weekend and we were served chicken soup……… chicken soup that contained my rooster. I would not, could not eat that chicken soup. 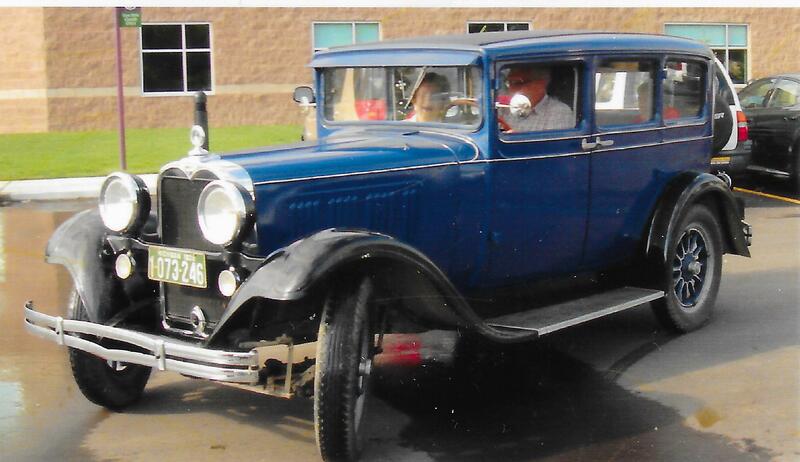 Since in my last blog I told you about my father’s restored Dodge, it leads right into this little story about the day he took sweet hubby for a ride in his restored Model T.
My father belonged to a group of Model T enthusiasts who were called, ironically, The Model Ts. The group was having their annual pig roast potluck picnic and he invited sweet hubby and myself along. They were going to drive there in the Model T and I was going to follow along behind them in the van, just in case. The Model T was stored in my father’s barn in Pontiac and the party was somewhere west of White Lake (?) I don’t really remember the city, I just know we drove west on M-59 for quite awhile. And what a ride it was!! First off, we discovered he couldn’t really see the lights as well as he always let on as he was going through them on pinks or oranges, depending on how you classify a yellow light that is in the process of turning red. Keep in mind that I was following them in our van and I had no map, no address or any directions other than being told that I had to “keep up”. So Pops would blast through on a pink and I would go through on what must surely have been a solid red. I was swearing under my breath and praying that no cops were around to see and write up what would surely be a hefty ticket. Second poor sweet hubby was shoe horned in the vehicle because once Pops found out that the poor boy had never ridden in such an old car, well he made sure he was going to ride in it. I had planned on being the one who was riding with Pops that day; didn’t quite pan out as I thought. We drove for what felt like forever till we got to the right neighborhood and found the right house, tucked back in on the very last road. Pops pulled over to park and I turned around on the street and parked across from them as the only other spot near them was a parallel parking spot and I avoid those like the plaque. Pops stopped the car, set the brake and jumped out to go to the picnic. Sweet hubby had to maneuver around in the seat to get his leg out so he could extract himself from the car. While he was moving around, the car which had been parked on a slight incline, started to roll backwards. Sweet hubby was starting to panic and yell, I was yelling to get Pops attention and suddenly people were running to help stop the car. We got it stopped, sweet hubby got out and we had to listen to Pops complain that somebody’s leg must’ve disengaged the parking brake. I had to also listen to sweet hubby complain that Pops hadn’t set the parking brake. Needless to say, I didn’t get to eat my roasted pig in very much peace!!! My friend over at http://denofthebeastlybear.blogspot.com/ just wrote a blog about attending his friends’ wedding down in Tennessee and the old cars that were there. In a conversation with him I found out that he had never ridden in a real old car till that weekend. WOW, I thought everyone had ridden in a model A or T or even an old Dodge at least once in their life. After talking with him it became apparent that not everyone grew up with a father who was obsessed with old cars. Almost as far back as I can remember, my father had an old car or two in the garage that he was restoring. Sometimes one would be to the point where he could actually drive it in a local parade. Of course, we weren’t allowed to ride on the running boards like we wanted to do for the parade; he deemed it unsafe. Other times they sat in the garage while he pursued his other passions, farming, wood work and junk collecting, and didn’t get restored. About two years before he passed away he told us that he was going to sell the Dodge. So we helped him by searching on the internet and figuring out what it was worth. We told him the price and I kidded with him that since my birthday was coming up that would be a wonderful present. He just wanted to sell it and that is just what he did, for a third of it’s value since it was fully restored. If you see this beautiful vehicle on the road or at a local (MI) car show; it just might be his old Dodge and you will know that, that person got a very good deal. I trust that all of you will have had a good weekend; I know we did. As usual, when a holiday comes along, we wonder how much of it we will be spending alone especially now with the youngest one recently married. So, we contacted the kids to see their plans. The oldest was heading to the lake house of one of her boyfriend’s friends and the youngest was spending time with her hubby ALONE for ALL weekend. So, that left us doing nothing with no one and figuring it would be another sucky holiday. When the girls were younger and we lived close to hubby’s parents, every holiday was a party!! We’d buy all the holiday themed party goods, make a bunch of party foods, chips, dips, and things to cook on the grill (if it was summer). We’d spend the day together joking and laughing, grilling and cooking – just having a really fun time. Cue the music to move us back from NY to MI and all of that changed. Suddenly the girls had places to go and people to see – other than us. Holidays like Memorial day, Labor day and the 4th of July became days where we were just alone; just another day. I decided this year to put an end to that. When I found out the kids’ plans for the 4th I set about finding friends that would be in town and who wouldn’t mind a couple of extra people. This is how we came to spend the 4th with some of my oldest friends at their house eating bbq ribs and numerous salads all prepared by their father and drinking ice tea till we thought our bellies would burst. And after all that food, including corn on the cob and watermelon, we pulled out what we had brought for dessert; two cartons of Breyer’s vanilla ice cream, brownies, chocolate raspberry, hot fudge, strawberry and salted caramel toppings as well as my extra marshmellowy rice krispy treats. Needless to say, we ate so well at their house that we didn’t need to eat again till the next day. On the 5th of July we had been invited to spend sometime and have dinner at the home of our older daughter’s Godmother. Almost her whole family was there, so there were plenty of adults and children to interact with. We had a hearty roast chicken dinner with all the fixings, followed a couple hours later by strawberry shortcake made with an angel food “loaf” cake and plenty of strawberries. In between dinner and dessert the kids, daughters and all the husbands played games while my friend set me down for a crochet lesson. (more on that in future posts). So, instead of this weekend being full of too much alone time while others’ partied around us it was, instead, filled with lots of fun, food and people who truly wanted us to be with them. I will be looking for another party or two to wrangle an invite to for Labor day weekend – who knows, by then maybe we will be in a position to have people over here for a change. Hope all of you had people to see or places to go to so that you weren’t just sitting on the sidelines twiddling your thumbs and stabbing at the remote control. Today marks the 2nd day that we have been up with Momma and Jay. Momma had shoulder surgery and needs a helping hand for a few weeks, so we packed our bags and drove up here. Life is soooooooo much quieter here than it is at our house. Even though we live in the same type of semi-rural community that they do, our neighbors are a bit closer and a ton noiser than theirs. While I have seen their neighbors’ vehicles, I haven’t actually seen the neighbors. The distance between them is such that I am comfortable enough to take the dog out for her early morning walks in my pjs; something that I would never do at home! I am looking forward to venturing into Millington, which is nearby, not because I haven’t been there before but because I recently found out that they have a place that has amazing cinnamon rolls. I found this out because I have a friend who must travel to places for her job and one of those just happened to be Millington and she wanted recommendations for restaurants. So, being me I Googled Millington and found a recommendation for a down-home diner style restaurant that also has “excellent cinnamon rolls”. I told my friend about the place and that maybe she should try it and let me know about the cinnamon rolls. She did and told me how amaziing that they were and how many she also took home. My mission this time is to get there and try one of those cinnamon rolls. Well, it is heading toward 10am and I should probably take a quick shower while Momma is busy reading her paper. and another day older and deeper in debt. Well, it was more than just a simple a/c repair; it seems that the leak in the a/c drip pan went down into the furnace and rusted a bunch of stuff so the entire system had to be replaced. All I can say is, thank God for kids who are willing to help you out – otherwise we would still be without heat or a/c and life would be miserable. It is on a payment plan that has a decent monthly payment, which is manageable. Now that little crisis has been resolved, we can get back to life as we know it. Other than when the power was out for 3 days 13yrs ago I have never lived in this house without central air, till now! The first real hot day we had last week we turned on the a/c and loved how it was cooling the house down. Then the cat came up from the basement and was yowling. She kept bothering me and yowling. So I did the usual check of food and water bowls; she kept yowling. I decided to check to see if her litter box needed cleaning and that is when I found water all over the basement floor!! So, as the thermometer creeps higher and it gets more unbearable we sit here under our ceiling fan and pray that we win the lottery. Having the a/c fixed would be great; having the money to accomplish that would be better. Better times are a coming! !